PASADENA, California, November 7, 2011 (ENS) – On Tuesday, an asteroid the size of an aircraft carrier will be passing closer to Earth than any large space rock has come since 1976. The asteroid, known as 2005 YU55, will sail past Earth safely at a distance of 201,700 miles (324,600 kilometers) at the point of closest approach, as measured from the center of Earth, says the National Aeronautics and Space Administration, NASA. Although the asteroid is in an orbit that regularly brings it to the vicinity of Earth, Venus and Mars, the 2011 encounter with Earth is the closest it has come for at least 200 years, said NASA. 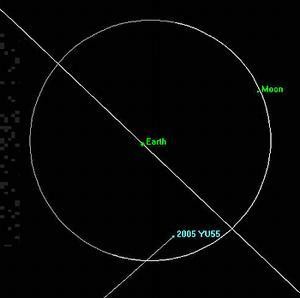 The trajectory of asteroid 2005 YU55 is well understood, says NASA. The gravitational influence of the asteroid will have no detectable effect on Earth, including tides and tectonic plates. On November 8, the asteroid will be at a point slightly closer than the moon’s orbit. NASA’s Deep Space Network antenna in Goldstone, California has captured new radar images of Asteroid 2005 YU55 passing close to Earth. The image was taken on November 7 at 11:45 a.m. PST, when the asteroid was approximately 860,000 miles (1.38 million kilometers) away from Earth. Tracking of the asteroid began at Goldstone at 9:30 am PDT on Novenber 4 with the 230-foot-wide (70-meter) antenna and lasted about two hours, with an additional four hours of tracking planned each day from November 6 through 10. Radar observations from the Arecibo Planetary Radar Facility in Puerto Rico will begin November 8, the same day the asteroid will make its closest approach to Earth at 3:28 pm PST. 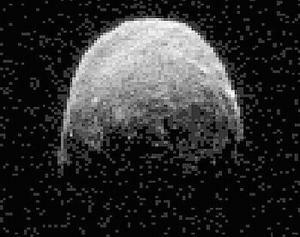 Arecibo radar observations of asteroid 2005 YU55 made in 2010 show it to be approximately spherical in shape. It is slowly spinning, with a rotation period of about 18 hours. The asteroid’s surface is darker than charcoal at optical wavelengths. Amateur astronomers who want to get a glimpse at YU55 will need a telescope with an aperture of six inches (15 centimeters) or larger. The last time a space rock this large came as close to Earth was in 1976, although astronomers did not know about the flyby at the time. The next known approach of an asteroid this size will be in 2028. NASA detects, tracks and characterizes asteroids and comets passing close to Earth using both ground- and space-based telescopes. The Near-Earth Object Observations Program at the Jet Propulsion Laboratory in Pasadena, called Spaceguard, discovers these objects, characterizes some of them, and plots their orbits to determine if any could be potentially hazardous. The Jet Propulsion Laboratory manages the Near-Earth Object Program Office for NASA’s Science Mission Directorate in Washington.